We closed the 20th year with the inclusion of a New London inner city class in our fall program and increasing our fall roster to include new riders. 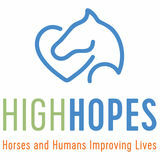 1 am repeatedly humbled by the outpouring of support for High Hopes, from throughout the communities whose people we serve. That support continues to come in so many, varied, and wonderful ways - in time and talent volunteered, in treasure and gifts in kind donated, in facilities enhanced and cared for, in landscape planted and tended, in an ever-stronger herd of donated horses working faithfully and patiently with our riders. Thank you all for making High Hopes possible. Through our joint efforts we are enriching the lives of some very special and very dedicated people. Listed below are those who contributed to our 1993-94 Membership Annual Appeal, The Old Lyme Antiques Show, Symphony in the Meadows V or the 9th Annual Student Horse Show; those who provided scholarship funds; those who gave a capital or endowment gift, a corporate gift, or a gift in kind; and our life members. To these supporters and to those additional persons have given of themselves in countless volunteer hours, High Hopes expresses its sincere appreciation. Physical Therapist Carolyn Jagielski watches as Volunteer Laurie DeMayo helps Rider Lisa Adrian mount Jeremy. 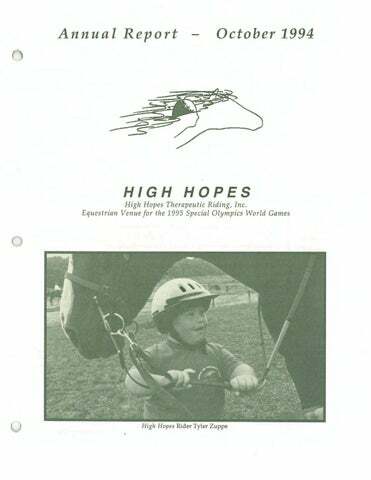 High Hopes Rider Kerry Christianson receiving a medal for her winning style at the 1994 Connecticut Special Olympics Equestrian Games. Marily MacKinnon Dana MacMillen Mr. & Mrs. Roland S. MacNichol The Mad Hatter Madison Beach Hotel Madison Cable Corporation Richard & Elizabeth Maltby Mr. & Mrs. Frederick J. Mancheski Charles -Henri & Marguerite Mangin Pat Mangs Mr. & Mrs . R. Mowry Mann Richard R. Manning City Coal of New London, Inc. Mr. & Mrs. H.E. Manville Ill Maples Motel Maria's Breads Maritime Bank & Trust Co. Mr . & Mrs. Denis Marois Mr. & Mrs. Robert Marrion E. Lea Marsh, Jr. Mr. & Mrs. Jean Martin Mr. & Mrs. Steven T. Martin Ms. Nancy Mathieu Mr. & Mrs. G. C. Matthiessen Mrs. Sidney L. Mattoon Maus & Son, Inc. Mr. & Mrs. Michael Maus, Sr. Mrs. Hiram P. Maxim, II Mr. & Mrs . George L. Mayer Mr. & Mrs . Kevin C. Mazer Diane M. Mazza Joe McAllister Rolling M. Ranch Mrs. William B. McAllister Dr. & Mrs. James R. McAraw Mrs. Roblee McCarthy Mr. & Mrs. John J. McCauley Mr. & Mrs. Elton B. McCausland Mr. & Mrs. David McCord Mr. & Mrs. Thomas McCormick Mr. & Mrs. Donald M. McCue Mr. & Mrs. John McCurdy Anne Burr McDermott David & Sally McDermott McDermott Lexus of New Haven McDonald's of Old Saybrook Mr. & Mrs. F. Patrick McFadden, Jr. Bruce & Barbara McGhie Julie McGovern Chip Mcllwain Mr. & Mrs. Bruce R. McIntyre Mimi McKenna Mrs. David McKillop Stratton McKillop Dr. & Mrs . Robert McKnight Mrs. T. P. McLaughlin Miss Marjorie McMenemy Mr. & Mrs . Edward L. McMillan, Jr. Listed below are those who contributed to our 1993-94 Membership Annual Appeal, The Old Lyme Antiques Show, Symphony in the Meadows V or the 9th Annual Student Horse Show; those who provided scholarship funds; those who gave a capital or endowment gift, a corporate gift, or a gift in kind; and our life members. To these supporters and to those additional persons have given of themselves in countless volunteer hours, High Hopes expresses its sincere appreciation. Renaissance Chet Reneson Restaurant du Village Reynolds Garage & Marine, Inc. Gary & Marilynn Reynolds Reynolds' Subaru Mr, & Mrs. Leland H. Reynolds Les & Diane Reynolds Mr. & Mrs. Joseph H. Rhodes, III Mr. & Mrs. Joseph H. Rhodes, Jr. AnnM. Rice Mr. & Mrs. Mark Rice Mr. Alexander Richardson & Ms. Elizabeth Karter Mr. & Mrs. Thomas Richardson Jeff & Holly Ridgway Mr. & Mrs. William C. Ridgway Mrs. John C. Ripley Mr. & Mrs. Hollis P. Risley Mrs. T. M. Ritchie Rob Rivers - The Salon Riverside Press Mr. & Mrs. George Roach Mr. & Mrs. William T. Robbins, Jr. Wayne Robinson Mr. & Mrs. John Roberts & Mrs. Raoul Roberts ''•":ob•erl:sFood Center Sam & Ruth Robins Mr. Christopher H. Robinson Mr. William H. Robinson Jack & Beckett Rodgers Connie & Al Rogers Mr. & Mrs. Sydney H. Rogers Mr. & Mrs. Ronald E. Romanowski Ms. Elizabeth Rooney Nancy & Jon Rosso RPS DeskTop Publishing Mr. & Mrs. Thomas Ruberti Mr. & Mrs. Martin M. Rutchik Ms. Jeanne C. Rutigliano, Jr. Mr. & Mrs. James Rutledge Carol K. Ryland Mr. & Mrs. Edward Safdie Saint Ann's Episcopal Church The ECW & The Outreach Committee Saint John's Episcopal Church Outreach Program Salem Country Gardens Salem Valley Veterinary Clinic Jeff Salkin LucySallick David C. & Jean T. Sargent Claire Sauer ,i !eobin & Lance Sauerteig '¥-Ann T. Savage Mrs. Linda Sawicki Saybrook Office Equipment Saybrook Oil Company, Inc.
Elise D. Seymour Mr. & Mrs. Joseph S. Shapiro Mr. & Mrs. Robert Shaw Shawmut Bank She Sells Sandwiches Bill & Petra Shearer Mrs. Allen E. Shepard John Sherman & Jean Callan King Mr. Tim Shriver Ms. Janet Shoemaker Shoreline Eye Group, P.C. Drs. Klimek, Reilly & Famiglietti Shoreline Family Restaurant Shoreline Pediatrics & Adolescent Medicine Elizabeth P. Shurts Shoreline Sanitation Mr. & Mrs. Lelan F. Sillin, Jr. Mary & Brian Skelly Harry & Toni Slifer Mr, Andrew Sloan Mrs. Bulkeley Smith Anne & Elting Smith Carolyn C. Smith Dorothy E. Smith Marcia & Roger Smith Tia & Seymour Smith Mr. & Mrs. Arnold Smaller Dennis R. Solomon & Linda Dyar Mr. & Mrs. A. Tappan Soper Ann & Wayne Southwick Mr. & Mrs. Malcolm Speirs Richard & Kathryn Spero Mr. & Mrs. John C. Spratt Stalsburg Express, Inc. Ms. Patti Stalsburg Mr. & Mrs. Robert Stalsburg Mr. & Mrs. Victor A. Stancliff Mr. & Mrs. Joseph Standart Mr. & Mrs. John Stankus Mr. & Mrs. Richard Stanwood Melinda & Valerie Stelzner Nancy F. Stephenson Joey Stetz, Ramona Farms Steed Read Mrs. John W. Steube Mr. & Mrs. Harrison Stevens Mr. John Stichter Storer Cable of Groton Harriet R. Strain Regina A. Strand Mrs. Thora Bird Streeter Mr. & Mrs. Samuel M. Strong, III Samuel M. Strong, Inc., Realtors Mrs. Frederick Sturges Mary C. Sullivan In Memory of Thomas Sullivan Summer Music, Inc.
Executive Director Barbara Schaffer with her mother-in-law, High Hopes rider Shirlee Schaffer on Tiger, and her father-in-law Larry Schaffer.